In these images you can see the PV-2 is oriented nose down (note shadow in second image). The tail has fallen off and rests nearby. 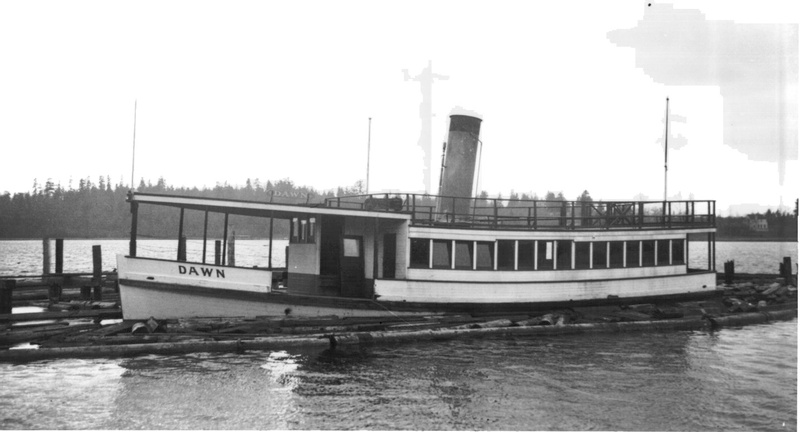 In 1946, 33 years after the year she was built, the ferry boat Dawn was scuttled in the dark and cold waters of Lake Washington. Her 94ft predecessor, the Cyrene had served the people of Seattle and the Eastside for more than 20 years, but in 1914 she was showing her age and was ready to be replaced. Captain John L. Anderson, the Cyrene’s owner, had owned and operated boats on Lake Washington since the late 1800’s. Purchased in 1907, Anderson also owned the Lake Washington Ship Yard in Houghton (present day Kirkland). His vessels became the best known and most well used boats operating on the lake. In 1913 Captain Anderson was traveling in Europe and saw boats that were different than what was currently running on Lake Washington. He was intrigued by their design and felt he could build a similar boat that was capable of increasing ferry traffic on the lake. So on his return that same year, Anderson built the Dawn to replace the Cyrene, and its design was based on memories of those boats he saw while traveling abroad. The Dawn’s purpose was to ferry passengers from Leschi Park to Mercer Island, including both commuters and students. The fair was 25cents round trip with a commuter 10 trip ticket priced at $1.00 – a 20 trip ticket for school children also sold for a $1.00. The Dawn was 55 feet long, able to carry 250 passengers and weighed 75 tons. Her steeple compound steam engine was a small but very powerful, and she was able to operate with a crew of just one or two. 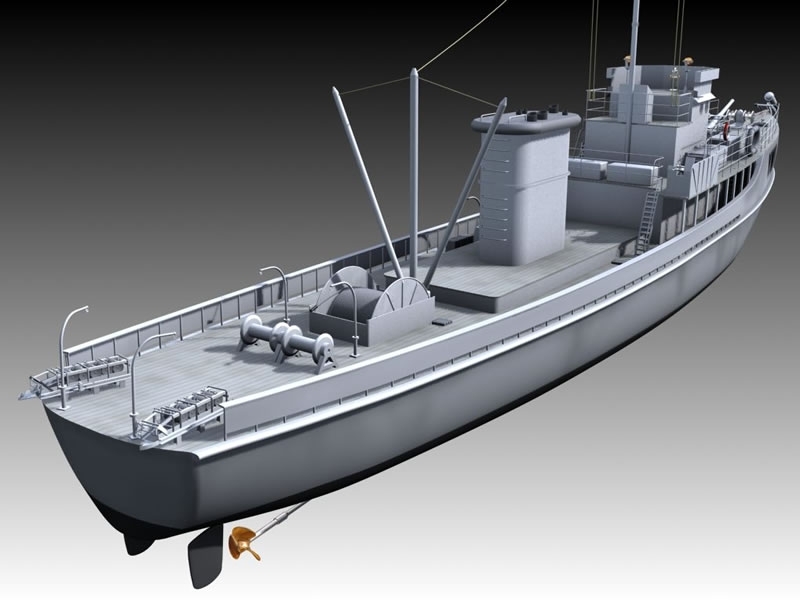 Streamlining her short length and broad beam was nearly impossible, so she was built with a square stern – which gave rise to a false story that she was a sawed off section of a larger boat. In truth, she was designed for economy and effectiveness, not beauty. Despite her seaworthiness, on Christmas Eve 1924 under a reported 80 mile an hour gale, the Dawn broke her mooring lines and sunk. She was raised, repaired and put back to work for another 14 years before she was retired 1938. Two years later in July of 1940 the I-90 Bridge was complete. Able to carry thousands of drivers across the water and saving them close to an hour of commute time, the bridge put the ferries of Lake Washington out of a job. The Dawn lived her last days above water docked at Rainier Beach before she partially sunk again. Worried she posed a hazard to the community, in 1946 the Seattle City Council contracted to have her towed out to the middle of the lake and sunk. I heard from the president of an Amphibious Attack Boat Group – a group of guys who use to be LCVP operators in WWII. 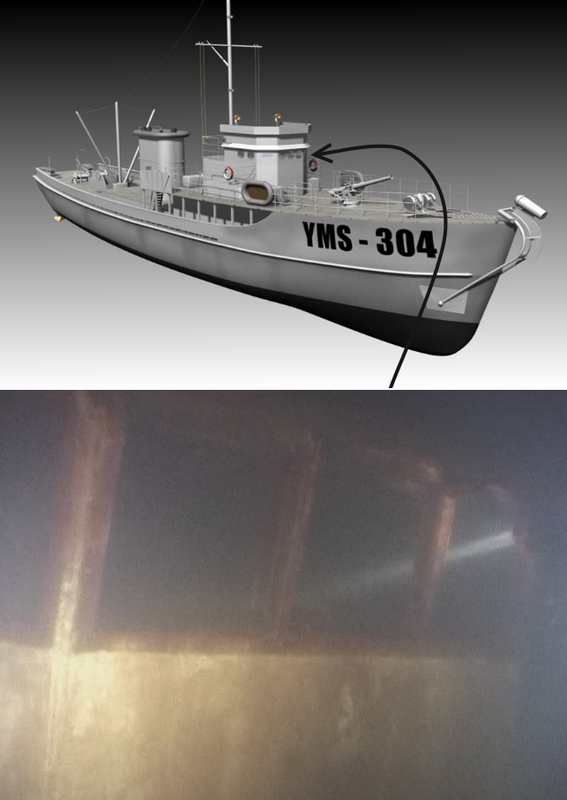 I wrote them some time ago about the LCVP we found in the lake, and asked if they had any info on it. I communicated that our LCVP was identified as PA 52-22. They indicate the PA52 designation means the LCVP we have was once a part of a ship named Sumter. In doing further research the Sumter carried 36 landing craft all of the PA 52 designation. Ours was Landing Craft # 22 on that ship. In the last three weeks we’ve had a number of dive teams on the YMS doing initial exploration. The wreck has now been penetrated in a number of areas, but so far no designation numbers or other identifying marks have been found. 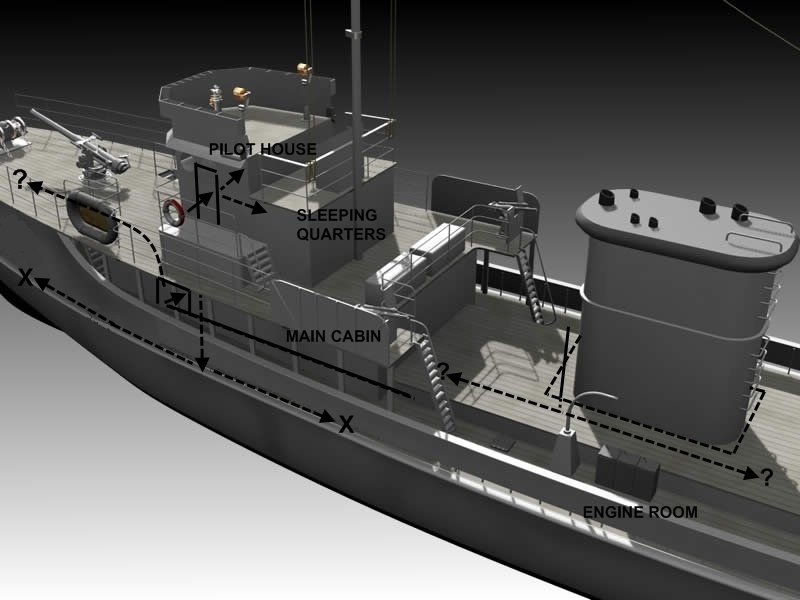 The primary points of entry have been in two areas: the pilot house and the main cabin below the pilot house – with both areas offering further pentration opportunity once inside. In the case of the pilot house, there is a small room aft that appears to have been used as sleeping quarters. The space is very tight, with various debris making exploration difficult. In the case of the main cabin, there is an additional door forward which has not yet been breached, and a small opening with ladder that leads staight down into the belly of the ship. This lower deck beneath the main cabin has now been explored, both forward and aft. 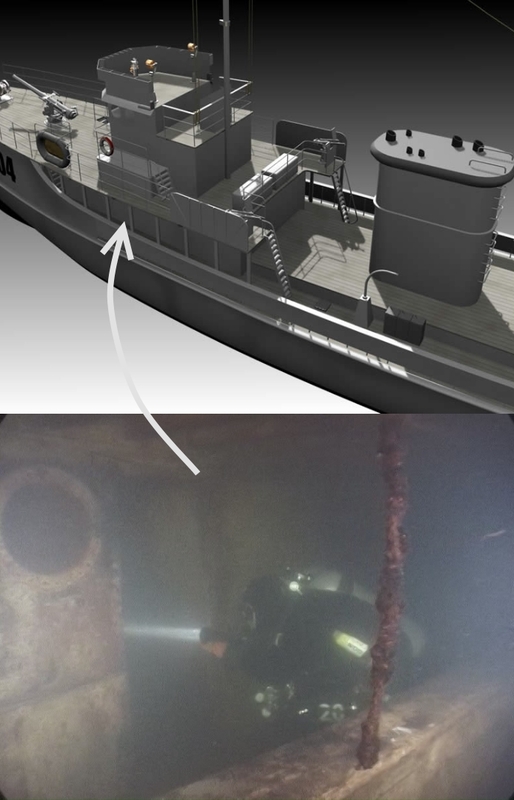 We had hoped that there would be a path that lead from these rooms below the main cabin back to the engine room, with an exit opportunity through the hole in the stern deck where the engines were removed. Unfortunatley this is not the case. The path forward leads to a deadend as would be expected this close to the bow, and the path backward appears to lead to a solid wall – possibly a firewall separating the engine room from lower sleeping quarters. The lake visibility has been particularly bad the last three weeks, but the interior visibility of this wreck has been completely horrible. We have divers talking of not being able to see their own 18W HID lights, rust and other particle matter continously falling from the ceiling, errant wires hanging about, it is just generally a nightmare in there. 100% of those that have entered the room below the main cabin have exited via touch contact with the cave line they established on the way in. Very dangerous. JaWS Diver Scott Boyd (www.boydski.com), who is known for taking some of the best underwater wreck photos ever captured in Lake Washington, was on the wreck this past Sunday as my dive partner, but we’re all going to have to wait until the visibility clears up before we get to see any of his photos. I include a photo below to show established & expected penetration paths. ‘X’ marks a known deadend and ‘?’ marks paths yet to be explorted. We put two teams of divers on the ‘new’ YMS the last day of 2007. It is a fantastic wreck; truly one of the best in the lake. We spent 25 minutes at depth and left feeling like there was a significant amount left of the wreck to explore. 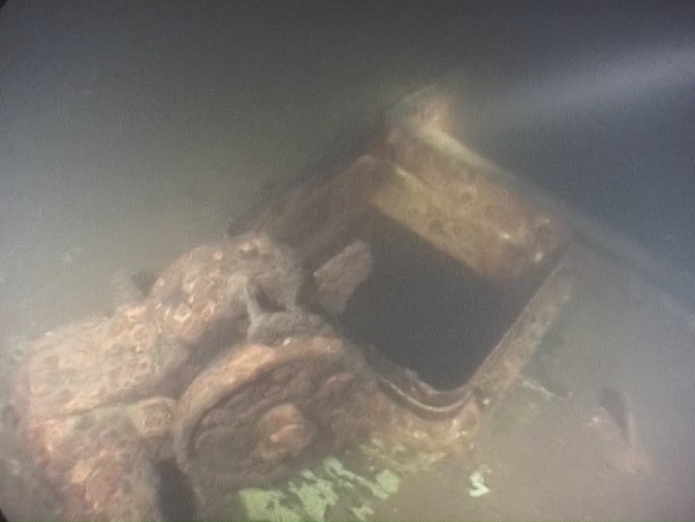 As mentioned before the engines, weapons, pilot house controls and various brass components look to have been removed prior to sinking, but otherwise this wreck is intact. Plus there is a signifanct amount of debris throughout. The Pilot House still holds a knocked over filing cabinet, the bathroom is complete with head and cabinetry and there are various other artifacts inside cabin rooms, on the stern deck – including two large generators, and on the bow. One thing we have not yet found is any designation numbers indicating which YMS we might have. Determining whether numbers can be located will be the focus of future dives. More reports on this one to follow. We’ll dive it fairly actively over the next few months. This past Sunday, in a joint effort between JaWS Marine and Innerspace Exploration, we located a previously undocumented Navy Minesweeper in Lake Washington. This ship is 130ft in length, 24ft wide and is sitting in 200ft of water off Sand Point/Magnuson Park. The YMS designation stands for Yard class Mine Sweeper. 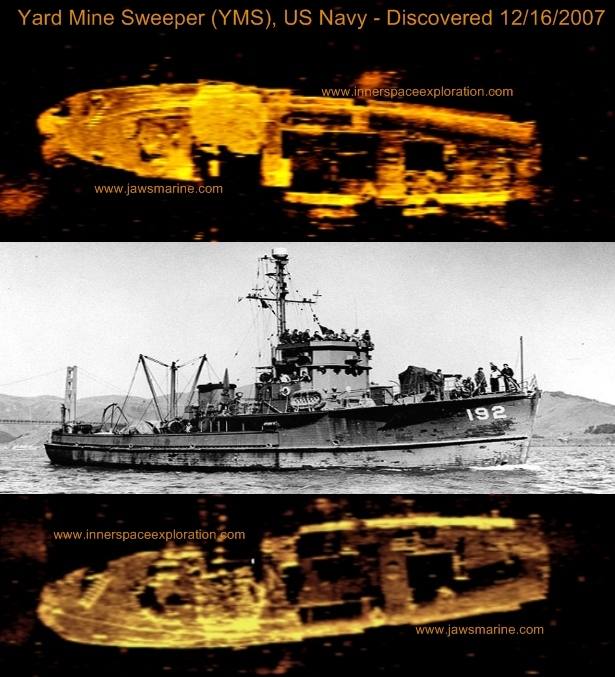 These ships were used during WWII for near shore mine sweeping as means to prepare for amphibious based assaults. More detailed history on the YMS located here and here. Dive and ROV operations have not yet begun on this ship, so we do not yet know which of the 481 YMS ships built during WWII we have located. 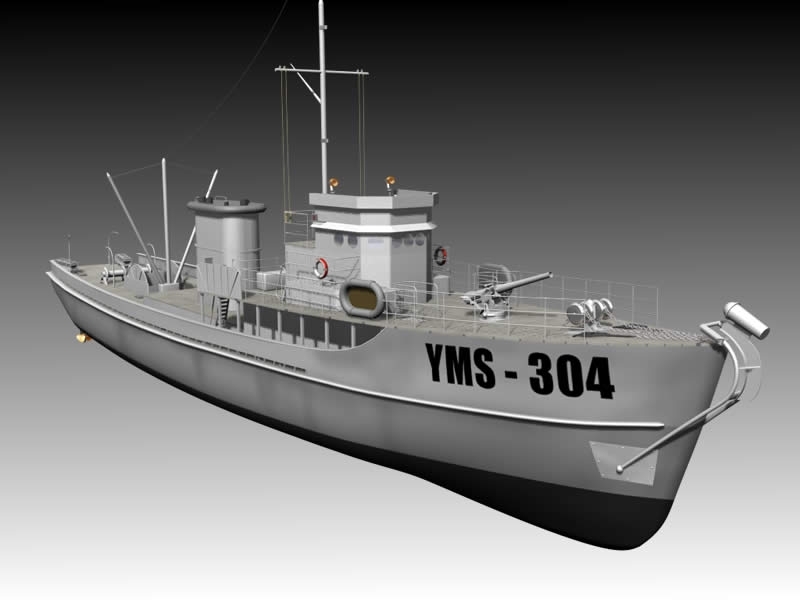 Based on experience with the relatively well known YMS-359 also located in Lake Washington, as well as other submerged minesweepers, we’re hoping the white designation numbers will still be visible on the bow. Included below are a few sonar images from our work on Sunday, as well as some YMS 3D modeling images courtesy of Infusion Studio’s 3D. 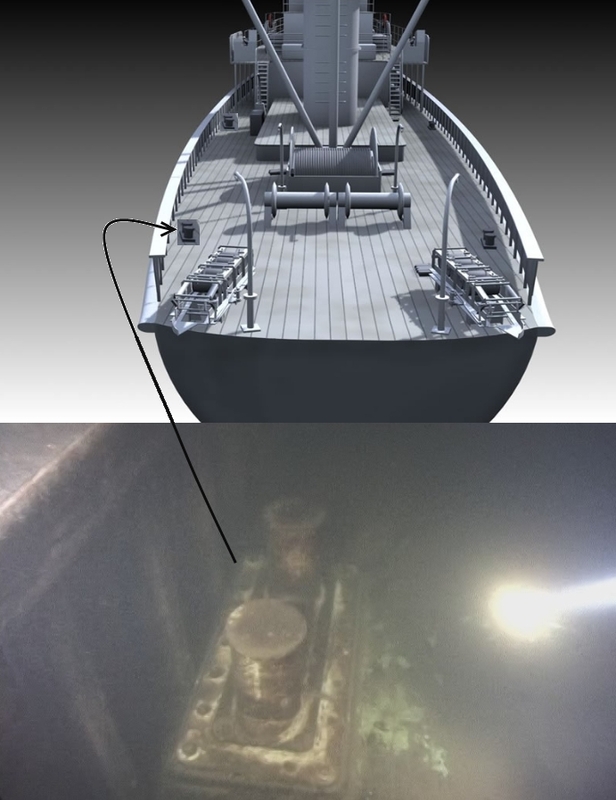 A few things to look for when comparing our sonar images to the model photos: the narrow, but tall pilot house, fenders on stern deck (these reflect very brightly in the sonar image), opening in hold where ‘spool’ use to sit, opening in hold at engine compartment (meaning engines were removed prior to sinking), forward mount for guns. More on this one as the story unfolds; I hope to post underwater images here before the end of the year. Despite truly horrible viz in the lake take, JaWS Diver Scott Boyd was able to get a couple good shots of the Hauler this past weekend. 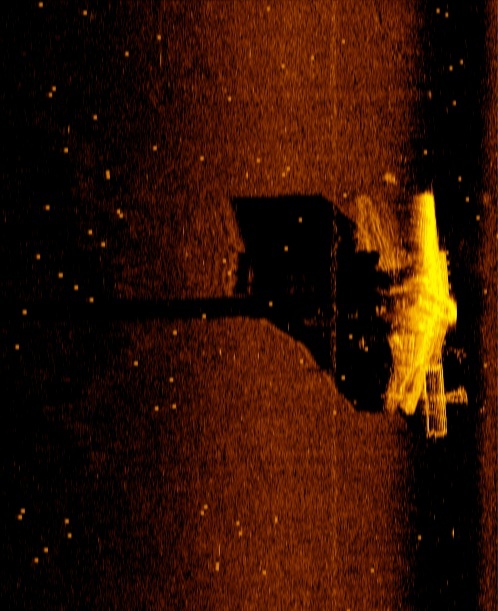 Additional image of the Hauler as recorded by the sonar crew today; great detail in the shadow of this image showing roof line, windows and open bow. If you look closely at the top down view of the wreck you can see a rectangular opening in the mid ship. 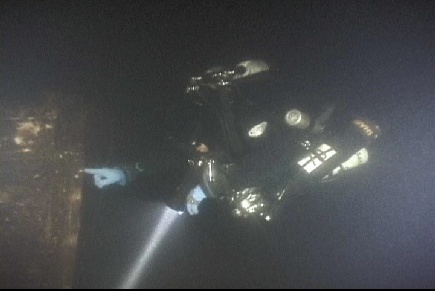 I dropped into this hole on the dive mentioned in the first post about the Hauler but I was focused toward the bow. 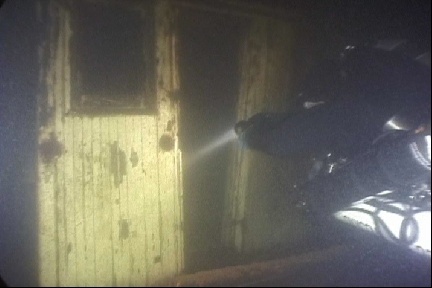 Divers on the wreck today discovered that entrance leads to a lower room back toward the stern complete with sink and mirror. This past Sunday I hit the water with a new sonar crew operating on the lake. Locally they are known as the ‘NAUI boys’ because of their training background. The short story on them is they are a real solid bunch of guys, good DIR divers and they are using sonar equipment by Burton Electronics. We focused on an area off Leschi pretty hard, looking for a specific wreck in that general location that we knew had been missing for almost 100 years. Monday evening we made the first discovery dives on this wreck, which lies in about 120ft of water. Pre dive I had somewhat convinced myself we had found the Acme. The Acme was a passenger steamer that operated on the lake before the bridges. It burned and sank off Leschi in 1908 and it happened to be 60 feet long – and there aren’t too many unfound 60ft wrecks in Lake Washington. As it turned out this wreck appears to be an old hauler of some kind. Possibly from the original Foss Launch and Tug Company. I am guessing its era is from the 1920’s to 1940’s. It has a round stern with no aft deck, square windows on the top portion of the cabin with additional portholes below. A square cabin face with one door and then a large open deck that has a 4×6 sized opening in the middle and a closed metal hatch near the bow. A wooden craft with large rudder and propeller still in place. It will take some time to identify this wreck. I am having trouble even locating a top-side photo of a boat that looks similar to this one. It reminds me of a container ship shrunk down to 60ft in length. One interesting note about the dive – we saw salmon all over this wreck; and they were aggressive. We rarely see much life at all at the bottom of the lake, so it was unique to come across a half dozen salmon. Special thanks to the NAUI Boys: Scott, Shaun, Marc, Greg & Ben on this one. 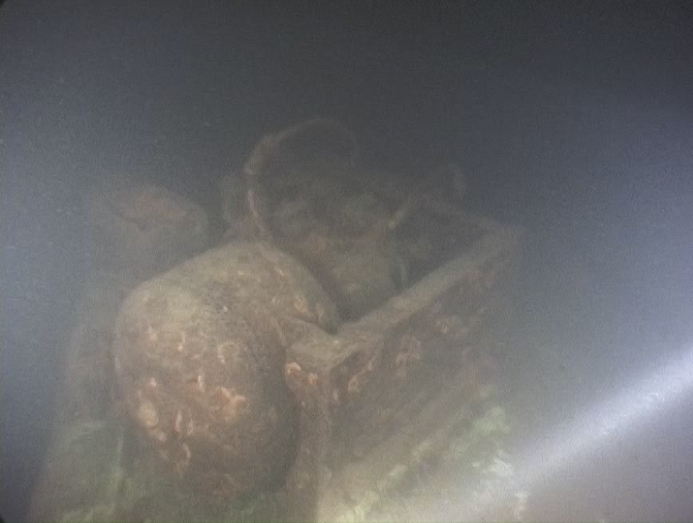 They were instrumental in locating the wreck, and the first divers to see this ship in what has probably been 70 or 80 years. 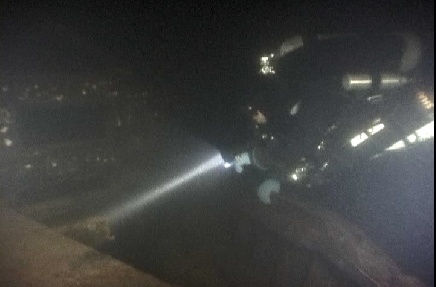 We conducted dive ops on the last of the three newly discovered targets in Lake Washington today. Initially, from a read of the sonar image, I expected Target1 to either be an early century sailboat or, because of the square lines, a PBR type military craft. In reality this one appears to be a work or fishing boat of some type, built for offshore use. The construction is wooden, but the roof is reinforced with GRP (glass reinforced plastic). There are ‘chain plates’ jutting upward on both sides like sets of metal ribs which look to have supported a small sail. Guessing the boat was built no earlier than the 40’s, no later than the 60’s (based on general construction), but sank no earlier than the 60’s. The later assumption made due to the presence of the GRP. We also noted there was protection above the forward hatch, used to prevent breaking seas from entering the forecastle, as support for this boat being built for offshore use. The Phoenix is very well intact, but generally stripped of equipment. It has a large main cabin, as well as an aft cabin that extends nearly to the stern. In the sonar photo what looks like what might be the stern of the wreck with a sail crumpled up behind is actually the back of the aft cabin with about 5 feet of semi collapsed stern deck behind. Inside there is a tarp or sail of some sort which looks like is covering something large, but not wanting to silt out the visibility for the video we were shooting today, decided against disturbing it. Also inside the cabin, not visible unless you swim inside, is an old ‘pot belly’ stove. Quite a nice find. I hope to have photos of the wreck and some of its artifacts up on the website next week. As promised, here are some UW photos of the SS Success. This past Sunday I made a dive with scret.org friends on the target previously described here as Target 3. This craft is approx 37ft long and is sitting in 200ft of water off Madison Park. The exact identity of the wreck is unknown. 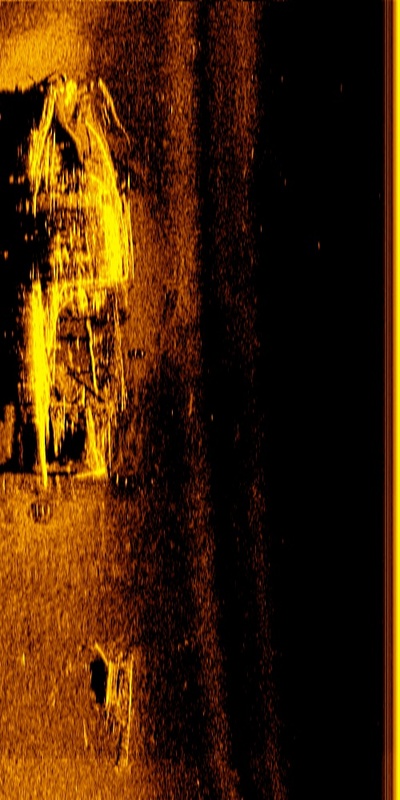 I’ve attached a side scan sonar image with this post so you can have a look – pay special note to the shadow of the sonar as it reveals quite a bit about the architecture of the boat. 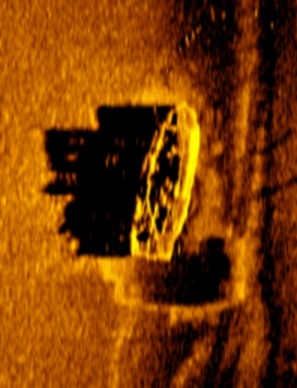 You can clearly see the great condition of the wreck in the sonar image. The entire cabin of this one is still intact. Prior to diving this one, and based on what we were seeing in the sonar image, I expected this wreck to be a small steam tug. At approx 37feet long it is too small to be a passenger ferry. 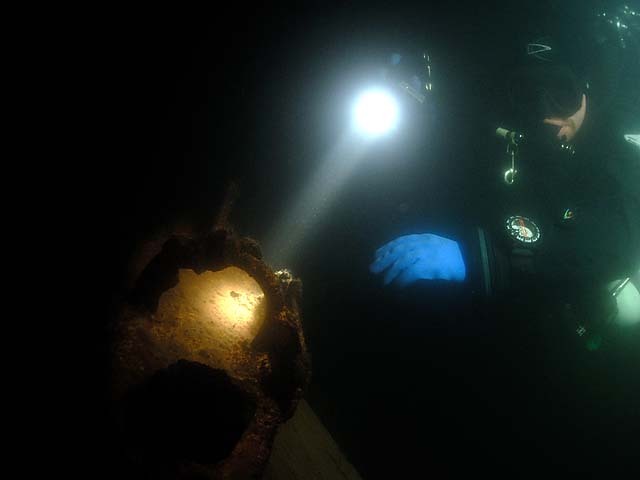 We were surprised to find on diving it that it was a gas powered craft – probably of the 30’s or 40’s. It could be that this wreck was a small work boat – or even a pleasure craft. 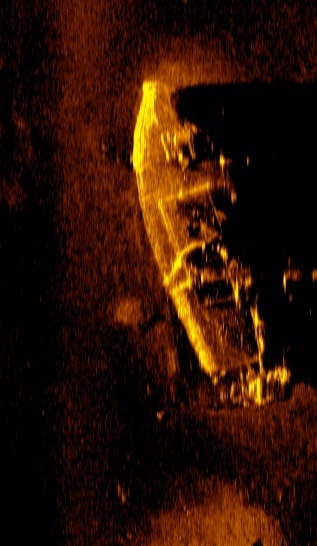 As can be seen in the sonar image, the wreck is generally intact. The forward and aft cabins are still structurally sound, there is a small washroom sized area inside of the cabin, with its door off the hinges. A single porthole on each side gives peering opportunity into the forward hold. There is no indication of how or why this boat sank; no sign of fire or collision. The guess is that it was intentionally scuttled as most of her equipment is gone. I’ll post some underwater photos of this wreck, as well the SS Success, here sometime soon. This past March, as part of research & exploration sonar work I was doing with Innerspace, we discovered three more shipwrecks in Lake Washington. All three targets are in depths ranging from 190 to 210 feet, and I expect all three targets to be of significant historical value. Target 2: 50ft long boat, 14-16feet wide, 9ft tall. This boat appears to have sustained heavy stern damage. Cabin still intact. Target 3: approx 40ft long boat, 8ft tall. 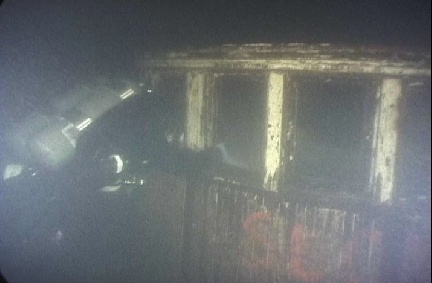 Appears to be a fully intact (including boiler and stack) cabin-forward passenger steamer. From reports of its sinking (general location), as well it’s dimensions & architecture, I believe Target # 2 is the remains of the SS Success. The sonar for Target #2 is included below. 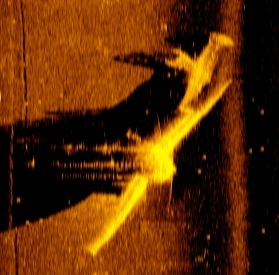 While the image I include here does not capture the target’s shadow – which often reveals the most about a target – what you can clearly see with this image is that the stern is badly damaged, the wreck has cabin structure and it appears in the sonar that the front of the cabin is somewhat rounded. 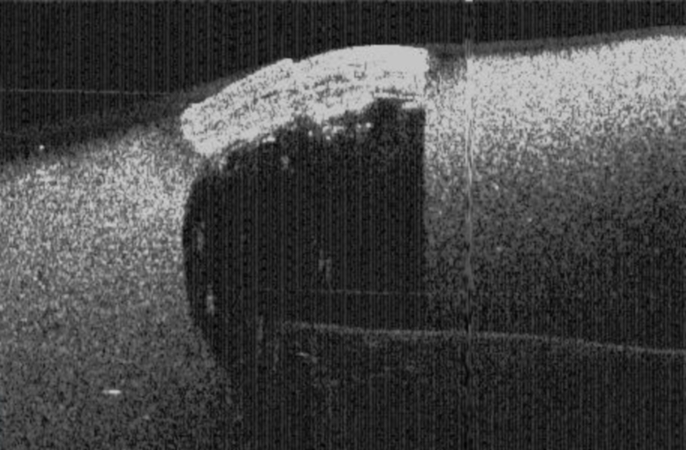 The wave in the image at the bow is caused by just that: a wave on the surface as we were scanning the target. We made dives on Target # 2 this past Sunday. She is sitting in 195ft of water, bottom temp was a cool 44 degrees and visibility was surprisingly poor for this time of year. That said, we were still able to get good video of this wreck and we’ll make it available for viewing at 5th Dimension. 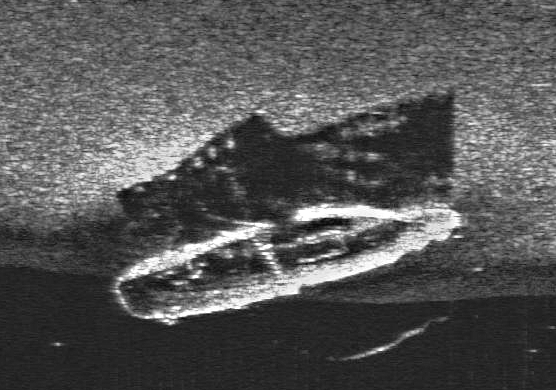 As is obvious from the sonar image, a significant portion of the stern has sustained heavy damage. Though from the dive, and later reviewing the video, there is no indication this damage was caused by fire or even collision. Instead it appears the wreck sank stern first and broke apart on impact with the bottom of the lake. The round nosed pilot house, the stepped cabin roof and the first room behind the pilot house are the remaining undamaged portions of the Success. The space behind the pilot house still contains a bunk – the room likely serving as sleeping quarters for the Pilot and/or crew. I made a dive on the Elfin today along with scret.org friends. The Elfin was built in Pontiac in 1891 as a replacement boat for captain Frank Curtis who had lost the Squak on Christmas Day, 1890. Curtis commissioned E.F. Lee to build the steamer. 4th of July, 1891 the Elfin began making round trips from Northrup’s Landing (present day Yarrow Bay) to Kirkland and Houghton, then across the lake to Madison Street. The Elfin made 6 of these trips per day and a one way fare was just 10 cents. In 1896 the Elfin was rebuilt; the pilot house being moved to the upper deck to yield greater passenger capacity and the 54.5 ft craft was also outfitted with a new steeple-compound engine. In 1900 the Elfin was destroyed by fire. 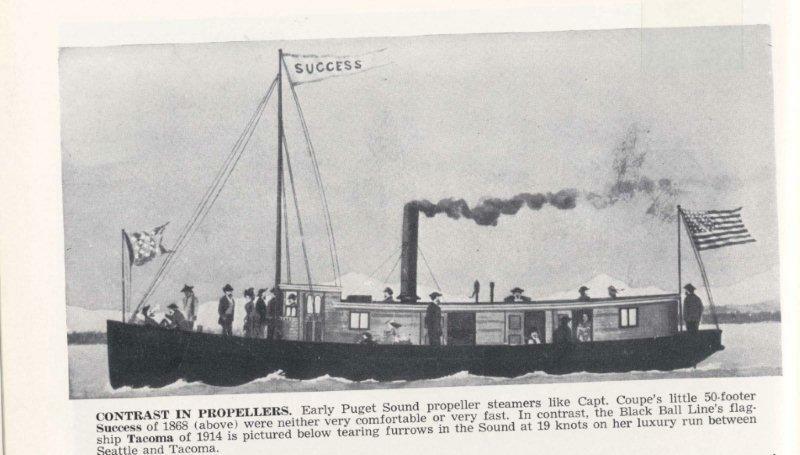 The engine was the only item salvaged and it was later incorporated into another small passenger steamer named Peerless, built by Captain Curtis and his sons who by this time had gone into the ship business for themselves. The Elfin’s engine then ran in the Peerless for a few years on the Black River for the Everett-Cooperville run on Puget Sound. Today the Elfin rests on a gentle slope off Houghton in about 140ft of water – the top of the wreck up near 125ft. 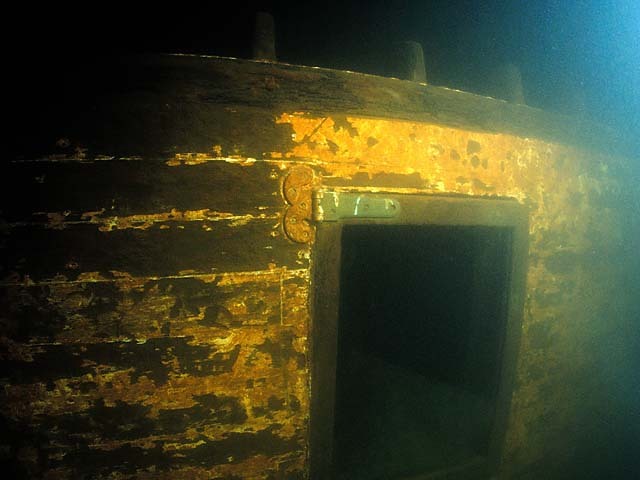 It is an empty burned hull that is sitting upright and there is a 2.5 foot rim of decking still around the outside edge up near the bow and back at the stern. Some of the white paint that made up the top half of the hull, and some of the dark paint used on the bottom portion of the hull, is still visible between the timber joints. Those timbers that were below the fireline are generally in good shape; and there are a couple short pieces of wood framing jutting upwards near the location of the pilot house. We circled the wreck from the outside two full times, then dropped inside the hull and swam the length of the steamer down and back. A second group of divers was planning to dive the wreck after us, and they were planning to shoot video. If they post the video I will grab some stills for the page here, otherwise you can reference scret.org for underwater images taken from 2002.